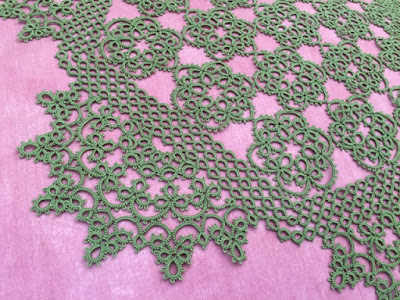 Le Blog de Frivole: Big Green Doily - Six Sides Done! Big Green Doily - Six Sides Done! I'm so glad I managed to finish the separate sides (the right word for curvy sides keeps escaping me! - what would you call them? Do you say "scallops"?). The six sides had three rounds each which all needed cutting and tying. No way to move from one round to the next seamlessly in this design I'm afraid - I did try! Now it's time to make rounds that go all the way around the whole design. So exciting! 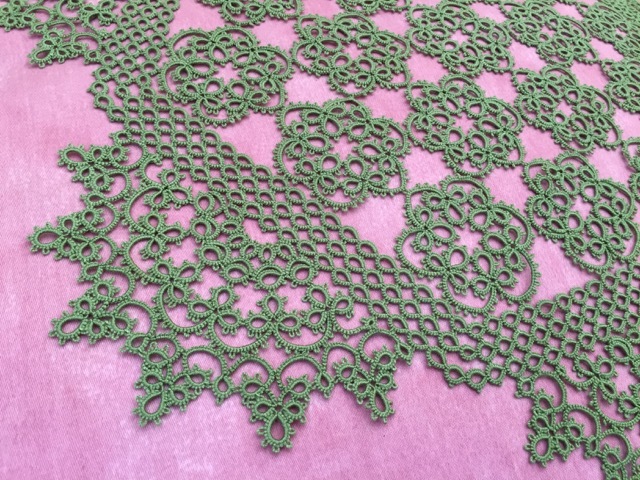 I made a video of me working on this doily. I decided to make the chains unflipped with reverse order stitches so I thought it might be interesting to make a video of it. I called it a "tat-chat" video rather than a video about a specific technique... I just tat and talk about what I'm doing. Still find it hard at times to keep talking clearly and not fumble on my words! It doesn't quite feel natural and the camera still makes me a bit nervous although it's just me and the camera, no one else is watching or listening! Silly really, isn't it? I love your video! It makes me feel like I'm right there with you as you tat. 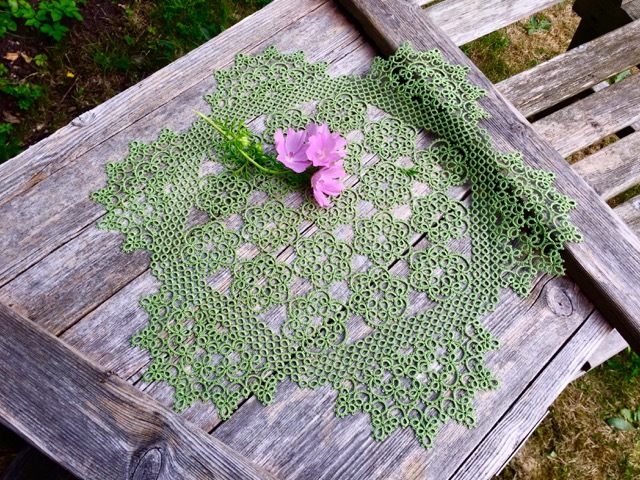 The doily is fabulous! How many balls of thread for this one? I'm using larger Babylo balls so I weighed my piece instead: in spite of its size, it still only weighs 42 grams so not yet the equivalent of two balls of Lizbeth. Thank you so much Muskaan, I'm glad you noticed the "zoom-ins"! I really tried to produce a better video and I think getting close-ups are really good (I have my daughter to thank for giving me some tips on video editing!). Looking wonderful! I look forward to seeing the next stage. Wieder ein wunderbares Video. Man sieht genau wie es gearbeitet wird. Danke Joelle. Thank you Johanna, yes, "shells" is a good word too, thank you! I love, love, love this video! 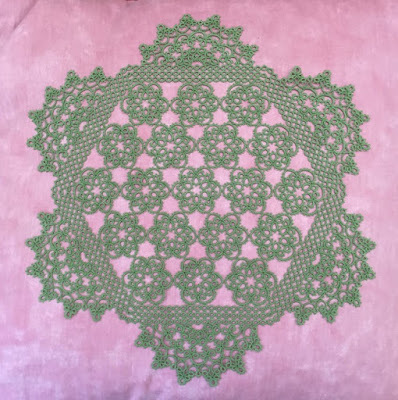 It's almost like sitting and tatting with you! (Some day...). I recently showed my daughter how to do these chains because I learned them from you-so clever! She was very grateful to learn the technique as well. No one would know that you are nervous, truly! The doily is so gorgeous, lovely work as always! Thank you so much everyone! I've now started on the next round. Posting again very soon!